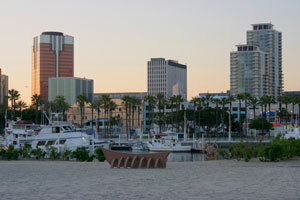 The City of Long Beach is a central maritime port for ocean-goers and container shippers alike. The Port of Long Beach is one of the world’s largest shipping ports. Naturally, Long Beach is a wonderful opportunity for billboards and advertising. Billboards on the San Diego Freeway (I-405) or billboards on the Golden State/Santa Ana Freeway (I-5) create a perfect combination of high traffic exposure and competitive billboard costs. There are also outdoor advertising opportunities at the Long Beach Arena where the minor league basketball team the Long Beach Jam play. The combination of affluent neighborhoods like Belmont Park and Wrigley Heights and emphasis on culture and art make Long Beach an effective advertising market.